Karel Čapek wrote that "The cultivator of a rock garden is not only a gardener, but a collector as well which puts him among the serious maniacs": if the great Czech Author says so in his wonderful book The Gardener's Year which has been in print in multiple editions in a spate of languages since it was first published in 1929, well surely it must be true? I doubt Vojtech would disagree. He APPEARS normal enough above surveying his realm. He lives in a lovely home and his garden is stunningly beautiful. He has a lovely wife (who's also a plant collector and therefore also perhaps suspect), successful grown children and a seemingly normal job (overseeing Germplasm collections for his nation) don't be fooled. He has lost count of his expeditions to Central Asia (is it 8 or 10? ), he has come to both North and South America repeatedly, China and Tibet numerous repeatedly and one cannot begin to count his trips to Spain, the Alps, the Balkans or Turkey. And he has brought back samples from all these trips that comprise his garden: most of these plants were not hitherto in cultivation and many are still unique. I have been more than a little fortunate in my life to have met great gardeners like Vojtech early in my career: he lived in Texas for a year with his family doing research, during which time he visited Colorado. And I have received precious seed from him over the years. And most recently, he was responsible with Zdenek Zvolanek for inviting me to the 3rd international rock garden conference in Prague which concluded today. He has gone far out of his way to help me on this trip: and I had a chance to visit his garden twice--these pictures are a concatenation of both visits. The iris was tucked in a crevice where many visitors missed it! A little blemish on the Acantholimon--but most plants in his garden were flawless--an amazing range of plants from dryland Mediterranean to plants of humid Chinese forests. The main range of his rock garden really does look like a bold mountain range rising out of his lawn! There were many contrasting touches like this monumental Paeonia rockii against a wall of his house. Although he keeps his garden meticulously labeled and has a terrific grasp of his colleciton--he'd lost track of this American alumroot: I'm guessing its name. He had a wonderful section with the best Eriogonum ovalifolium v. depressum I've seen in cultivation and especially happy American phloxes. A monumental specimen! I foregot the cultivar name--maybe he'll read this and let us know...check back. I'm pretty sure this is the Greek species--although I believe he's one of very few people who have seen all three species of European shrubbies--the others being the similar V. kosaninii from the Balkans and V. cazorlensis from Spain. I was so pleased to see this fantastic species displayed so prominently. I am in my Iris phase--did I mention? 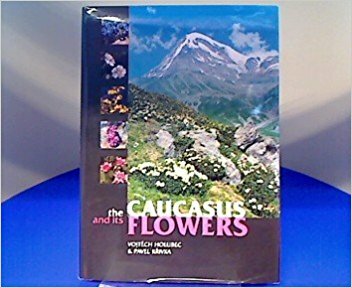 Vojtech has co-authored a magnificent book that you should buy if you haven't: there are some ridiculously inexpensive new copies of this for sale on Amazon, (click on the line before to find them)...and he is planning on publishing a new book on the flowers of the Tian Shan mountains of Central Asia in the next year: which I will be sure to promote! Best of all click here: http://www.holubec.wbs.cz/ and you can see his amazing pictures from some of his travels and access his seedlist! The orchid is amazing. I don't think of orchids as rock garden denizens.